REVEALED: Deepika Padukone, Ranveer Singh, Shahid Kapoor Get Whopping Pay Cheque For Padmavati! Sanjay Leela Bhansali’s upcoming film Padmavati starring Ranveer Singh, Shahid Kapoor and Deepika Padukone in the lead roles is currently a talk of the town ever since the first trailer of the film was released a few days back. 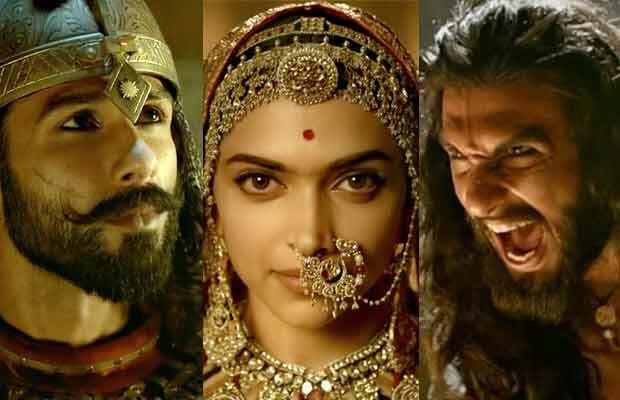 Deepika Padukone will be seen in the titular role of Rani Padmini, Shahid Kapoor plays the role of Maharaja Ratan Singh and Ranveer Singh plays the role of Allaudin Khilji. The trailer of the film took social media by storm and fans couldn’t get enough of the amazing trailer. As we all know, Padmavati has already created a lot of buzz even before the shooting of the film began. The film even landed into trouble but nothing stopped the makers of the film to continue shooting for the film even amid all the troubles. The larger than life sets and huge visuals in the trailer prove that makers of the film have left no stone unturned to bring the best for the audience. Wondering, how much the actors pocketed for themselves for being a part of the film? According to reports, the stars of the film are getting a heavier pay cheque but Deepika Padukone takes the highest remuneration. Yes, the actress is getting paid more than her male co-stars of the film. Jim Sarbh: Jim Sarbh, who plays the role of Alauddin Khilji’s protégé Malik Kafur, is getting Rs 70 Lakhs for the film. Aditi Rao Hydari: Aditi Rao Hydari, who will be seen in the role of Mehrunissa, is reportedly getting Rs 85 Lakhs for the film. Shahid Kapoor: Shahid Kapoor, who will be seen playing the role of Deepika Padukone’s husband Maharawal Ratan Singh, is getting a huge sum of Rs 6 crore for the film. Deepika Padukone: Deepika, who will be next seen playing the titular role in Sanjay Leela Bhansali’s ‘Padmavati’, will literally be writing history in Indian Cinema with her historic film. Deepika, who made her Hollywood debut this year, is getting a huge sum of Rs 11 crores for the film.